Some of our political leaders seem to have forgotten the fundamentals of the water cycle from day one of Kindergarten. Cause and effect drives climate and our energy system is inextricably linked to it. Just this week, new national energy minister Angus Taylor published an opinion piece in the Australian Financial Review, titled “Cut the energy virtue signalling and start serving customers”. In it he lambasts the parliamentary Opposition and climate rationalists for putting emissions before customers’ hip pockets; and even denounces big business for pursuing corporate responsibility and sustainability. What’s most disappointing about this, and indeed is a rhetorical deficiency from pro-fossil conservatives the world over, is the rejection that cutting carbon pollution and creating an electricity system that is better for everyone are inextricably linked. They must’ve slept through Year 10 macroeconomics as well. The good news is, the world is moving on without them, albeit slower than what’s required to meet our Paris commitments. This is not being driven by academic climate science, which is just too easy to ignore, but rather by real-world impacts that can’t be brushed aside. In the past week, two extreme weather events made landfall in separate regions of the globe: Hurricane Florence hit the eastern seaboard of the US; and Typhoon Mangkhut wreaked havoc on coastal south China and Hong Kong. This, exactly one year after Hurricane Maria devastated Puerto Rico and Dominica. Regardless of whether you think climate change caused or exacerbated these weather events, they are very, very expensive for the people impacted, their governments, and the global economy writ large. The US National Oceanic and Atmospheric Association (NOAA) estimates the cost of Hurricane Maria at around USD $90 Billion. Good for consumers? Not really, and not to mention the tragic fatalities as a result of this and many other extreme weather events, and the global flow-through via rising insurance premiums. Australia is not immune to the impacts of massive storms. In September 2016 energy was propelled to dinner table conversations nationwide due to a statewide blackout in South Australia. Initial reports of the cause of the blackout being wind farm malfunction turned out to be largely unsubstantiated, with the market operator’s investigation revealing the primary cause was felled transmission lines as a result of excessive wind speeds. What’s surprising is that this drove greater interest in investment in large-scale transmission and centralised infrastructure, rather than further decentralising of essential energy system infrastructure to increase system resilience. By comparison to the South Australian experience, after Hurricane Maria ripped out around 80% of Puerto Rico’s poles and wires, leaving the electricity system requiring a complete rebuild, they are building in planned resilience through new technologies. Already about 11,000 battery systems have been deployed, with proposed microgrids to feature in further resilience plans. If we go back to school-level microeconomics, we find that that the declining cost curves of batteries, rooftop solar and other distributed energy resources (DER), like controlled loads, means they are a very rational investment. Here in Australia we have one of the most distributed grids, driven primarily by consumers installing solar PV on their roofs. And this is forecast to continue out to the 2040s as the costs of batteries and other DERs declines further. Many consumers are not just investing in DERs because it makes financial sense, they’re doing it for independence and resilience. Neither of which are bolstered long-term by investment in centralised energy infrastructure, despite the call from many of our leaders that so-called “dispatchable power stations” will increase system security. 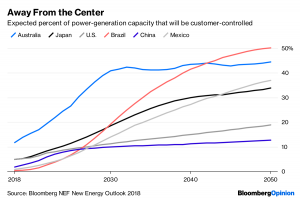 Power customers the world over are voting with their wallets and defecting their loads from the grid, and this is already having system-wide impacts. Currently a quarter of Australian electricity customers have solar on their roofs. Many of them will install a battery in the coming decades. Many more will install smart energy management solutions like those we’re working on at Wattwatchers. By optimally controlling large loads behind-the-meter like air conditioning, pool pumps and hot water heaters we’re saving customers money and contributing to the stability of the entire system. Our IoT solutions are an affordable and easily deployable energy efficiency system for residential and business customers seeking to take control of their energy bills. We think the future is very bright and positive because with ours, and others’ DER solutions, customers’ bills and global emissions will be reduced in tandem whilst increasing resilience. What’s more, it’s happening so fast that backward-looking national leaders can’t keep up! *Darius Salgo is a technology specialist and business development manager with Wattwatchers Digital Energy. An engineer by qualification, he also is a co-founder of peer-to-peer energy trading startup Nexergy.